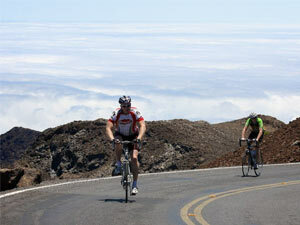 If you really want to immerse yourself in the spirit of the Hawaiian Islands, a bicycle tour is one the best ways to do it. You’re surrounded by all sights, smells and sounds, and you’ll really feel in touch with the islands. Of course you could tour by car, but the car insulates you from the environs, and keeps you from noticing many of the small details that you would notice on a bike. There are two options for cycling in the islands. The first is a guided tour, which will provide you with a bike, lead you on the best roads in the area, and will pass by the most interesting sites to see. Guided tours are also generally accompanied by a support van that is available to pick up any riders who do not wish to continue pedaling. On longer tours snacks, drinks and lunch are provided so the riders are freed from having to carry any extra weight, or worry about running out of water. Your other option is the do-it-yourself method. You choose your own itinerary, and you can change it on a whim. You’ll be responsible for finding your own food, and finding the best route, which in many cases is half the fun. Shipping your own bike over to the islands is probably the best bet for extended touring. Your personal bike is set up the way you like, and you will be free to move from one island to the next. Make sure to lock your bicycle up if it is not within your sight. If you’re only planning a one or two day ride, you’ll be better off renting a bike once you get here. If you choose this option, it would be a good idea to some research before your trip. Check out a few Hawaii cycling guide books and a quality map of the area you’ll be riding. That way you’ll be ready to hit the road as soon as you get here.